I read Arwyn's post yesterday and it has me thinking. I know that I have posted about similar things in the past but, I just have to say it again. Spasmodic Dysphonia is such a "silent" disorder in more ways than the obvious. SD causes you to either totally lose your voice or to live with a voice which sounds nothing at all like your "normal" voice. The people around you notice this silencing. They notice that you are not talking as you once did. They notice that you don't talk much unless you have to. They notice that between Botox shots your voice rides that roller coaster of improvement and decline. However, the part of SD which isn't observable is probably the most difficult to deal with: the psychological impact of SD. People who don't have SD often minimize the psychological impact of the disorder. After all, it isn't like you are going to die if you have SD. You just have a problem with your voice! Sure, YOU try walking a mile in our shoes and then you will find out what it is really like! First of all, you have to deal with the fact that you are "broken." No longer do you have a healthy voice. No matter if you have other ailments, the loss of voice hits you hard. After all, how many people ever dream that your VOICE could be taken away from you? The voice is the constant. No one really thinks about it too much but just takes its presence for granted. Suddenly, something is wrong and your voice isn't "right" anymore. Next, you have to deal with the fact that there is no cure for SD. That means that you are broken and there is no way to "fix" you. In fact, science more of less ignores your problem (SD) because there are not many people who have the disorder (personally, I think 50,000 or more is enough) and the disorder doesn't "significantly impact daily life"(excuse me????). So - you are "stuck" with this voice problem which has no cure and little research being done to find a cure. It feels like the medical profession has written your problem off as "insignificant." All of this makes you feel isolated. It makes you feel unimportant - at least in a medical sense. This causes a feeling of frustration. Now, having a disorder which is incurable and which no one seems to know about (oh - did I mention that part? It is frustrating too! 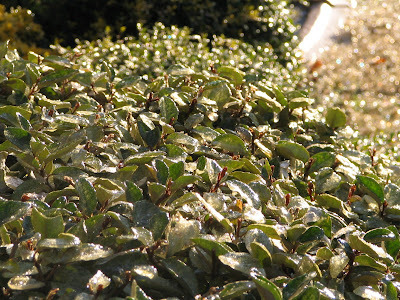 ), you have to continue, as best as you can, your daily life. Your voice is no longer "normal" so people ask if you are sick ALL THE TIME. They ask if you have allergies ALL THE TIME. They treat you like you are infectious even after you assure them that you don't have a cold. After all, you must be lying because what else would make you sound so horrible? Day after day you must deal with the same questions over and over and over again. Sometimes, you get the same questions from the SAME PEOPLE who asked them yesterday! These people start to give you "helpful suggestions" about how to take care of your voice. Drink tea with honey and lemon. Gargle with salt water. Drink plenty of water. Use this brand of allergy medicine. As if any of that will help SD! Mix in that you are basically unable to speak to people when in a noisy environment. Have you ever tried ordering food in a loud restaurant only to be asked to repeat yourself over and over and over? Then, when you still can't be understood, the waiter starts to treat you like a) you are stupid, b) you are deaf (interesting, don't you think? ), or c) you don't exist. Now you are dependent on other people to help you in social situations. Finally (for this post - there is much, much more to dealing with SD), consider the telephone. Once an instrument that connected you to the entire world, it is now feared and dreaded. People on the other end can't hear you well enough to carry on a conversation. Every time the phone rings you hope someone else in the household will answer it so you don't have to. You feel isolated because of your inability to talk on the phone. What does all of this do to a person psychologically? Well, basically, it rips every shred of self-confidence out of your body and throws it on the trash heap. It makes you feel as if you are not worth being heard. It makes you doubt your ability to think because you are unable to communicate your thoughts. It makes once sociable people into virtual hermits. Anxiety about talking in public or on the phone becomes a regular part of life. Frustration about your voice is a constant companion. Depression creeps in to fill the void left by your self-confidence and it is darn difficult to get rid of! SD is not just a physical or neurological disorder. It is also a disorder which deeply affects your psychological health in a negative way. Even the strongest of people are dealt with blows which are difficult to recover from. It isn't a sign of personal weakness. It is a sign of just how horrible SD can be. Voice Update: Still doing pretty well but my allergies are really causing a lot of drainage. The drainage is causing a lot of coughing and sneezing which is causing my muscles to tense up. Not good for optimum voice production. I am continuing my massage and exercises. Onward! If It Isn't One Thing . . . Sorry I missed you yesterday but I had a killer migraine and since I also had classes all afternoon, I decided to sleep instead of blog. Luckily, the headache pretty much went away by the third class. The first two were a bit difficult but . . . I survived. By the way, did you know it is tough to concentrate on sign language when your head hurts? I am very glad that our hot water tank is now installed and functional. There are still issues with just how warm the water gets but I think that is just because we need to set the heat a bit higher. Hopefully. We will see. That is one thing that is fixed. However, there is something else that is "hay-wire." Our telephone. First of all, I should explain that we are old-fashioned. We don't have cell phones. Okay, that isn't exactly true but, we only have cell phones that are pre-paid and no one has our numbers since we only call each other. Also, the phones are not generally on unless we have prearranged it with each other. Is that as clear as mud now? Okay - so, our phone isn't working. Apparently the ice storm we had here knocked out the line or something. The phone hasn't worked since Tuesday. The phone company says it won't be fixed until tomorrow, at the earliest. What a bummer! If there was a real emergency, we can use our pre-paid cell phones to call someone but . . . how annoying! Oh well! If it isn't one thing, it is another! Voice Update: Still doing well. I got the chance to explain SD to some new people yesterday at the college - which reminds me, I need to put more cards in my purse! I didn't do my exercises yesterday since I was asleep pretty much all day and when I wasn't I was still in pain. Not much of an excuse, is it? Cold Water Chronicles (Finale) and Ice, Ice, Baby! Well, the hot water dudes, as they will forever be known, finished the installation of the new tank around noon. Not really in time for me to take a shower before class since it would take at least an hour for the water to heat and I would need to leave for class around 12:30 or so! Rats! The weather, however, came to the rescue. 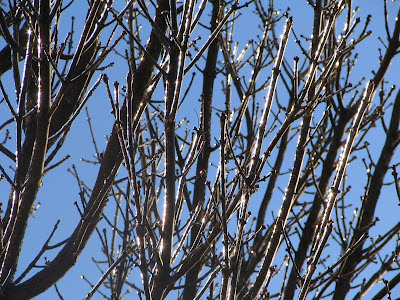 Due to the big ice storm which was being anticipated, my classes were cancelled! Great! I could stay at home and be smelly with Hubby, who had taken the day off from work to be home while the dudes installed the tank. Once we knew that my classes were cancelled (which ended the big debate about if I went of not in the uncertain weather conditions), it was nap time as we waited for the water to heat! What a day! After our nap, we cranked up the dishwasher which was full of pretty much every piece of silverware and dinnerware that we own and made a Digiorno pizza. A nice way to end the evening. The hot shower - it will wait until tomorrow morning but I did get nice hot water to wash my face before going to bed! YEAH! I LOVE THE HOT WATER DUDES! And now . . . the ice. 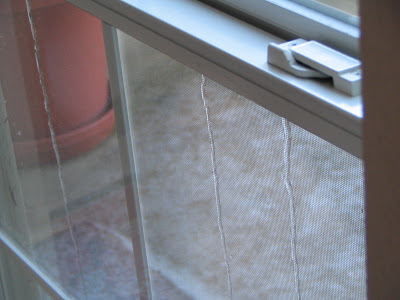 During the evening yesterday, we got quite a bit of sleet tapping against our windows. That continued until about midnight (I was awake to hear it not tapping anymore). The temperature, which had continued to drop all day, was hitting the upper twenties when we went to bed and so Hubby and I snuggled under the covers and wondered what we would face when we got up in the morning. 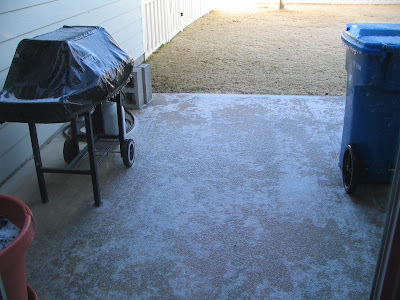 It was hard to get good pictures of the ice as I was sliding down the yard - yes, the yard! I was in the grass thinking it would be easier to walk there than on the ice . . . wrong! I literally slipped and slid on the grass! Needless to say, I didn't walk this morning. I don't think I would have made it past my own yard before hitting the sidewalk several times! What a wonderful, winter wonderland! Of course, Hubby isn't at work because of the ice and we can't go anywhere until some of it melts! But at least we have hot water! Voice Update: Still doing well. I am doing my massage like a good girl and I was reading out loud yesterday to exercise my voice since I didn't talk too much during the day. What fun! After a quick sponge bath, I headed off to ASL lab where I spent a good portion of the afternoon. Returning home, Hubby was fast asleep - a sure sign that he was not feeling well. I made myself a panini and then settled in to watch most of the Chronicles of Narnia which I had on my dvr from before Christmas. It was a nice time as I watched, fast-forwarded through the commercials, and played with the kitties. Soon I began thinking about dinner. Soon I was whipping up a "skillet meal" which is just all kinds of stuff in a skillet cooking together. Last night it was ground meat (beef and turkey), pasta (mini farfalle), carrots, broccoli, Parmesan cheese, a little cream cheese, a little milk, and seasonings. It ended up being pretty good and was just the ticket for a cold, rainy night (in my mind anyway!). After dinner I was faced with the growing mountain of dishes which needed to be hand washed. Not having any hot water was a super excuse to not wash them but now the kitchen was beginning to look like I had emptied all my cabinets and left everything on the counter. It was time to wash dishes. The microwave was soon busy heating water as I organized the washables into categories, which to be washed first, second, etc. I was trying to be strategic so that I could optimize the hot water. As the water was heated I slowly began washing - small thing first since the amount of water was minimal and then larger things as I added more warm water. It was wash dishes, rinse (in cold water), get more warm water from the microwave, wash dishes, rinse in cold water, get more warm water from the microwave. What fun! Luckily, Hubby felt well enough to help out by drying the multitudes of dishes I washed. I did say that I had a mountain of dishes to wash, right? After dinner it was time for the next challenge - washing hair. Both Hubby and I felt a bit . . . well, greasy . . . because we hadn't washed our hair since Friday morning. It was more microwaved water and trips to and from the bathroom for the non-wet person. It wasn't the best thing ever but it seemed to work and we both now have clean hair! 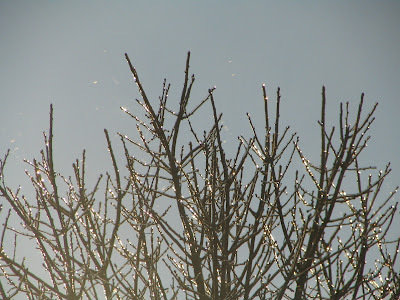 It is cold and rainy here with the threat of an ice storm. The threat has paralysed the metro-plex with multiple school closings (I haven't seen that my college is closed yet) and all kinds of special weather reports. Ice in Texas is a serious thing because we don't have salt trucks (we DO have sand trucks which help not that much) and we have miles and miles of soaring overpasses. Also, we have a multitude of people who will slow to a crawl in rain but speed up to insane speeds on ice. Go figure. 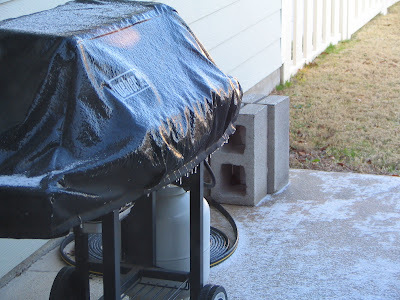 Anyway - as Hubby and I went to bed last night we were a little worried that the threat of ice would keep the water heater dudes from coming this morning. That would mean even MORE sponge baths and hair washing ordeals! It took me a while to doze off while worrying about if I would get a nice hot shower before going to class or not. Of course, I didn't think about the class possibly being canceled due to the ice. I decided not to walk this morning when I woke up to 33 degree temps and rain. I know - I am a wimp but sleeping in felt soooo good! I slept for an additional hour - heaven! While I was dozing, the water heater dudes called Hubby and said they were on their way! Hooray! When I got up, the dudes were at the house and were ready to rock and roll. They had to get a permit from the city (huh? The other guys who installed this heater didn't get a permit!) and promised me a hot shower shortly! WOW! My heroes! As I am typing this I can hear clunking and banging and sawing (??) up in the attic. I am thrilled! Voice Update: Still doing well. My massage is getting done and so are the exercises. My only question - why am I so darn tired??? Cold Water Chronicles (Part Two), etc. I just swept into my house on a gust of cold air from my morning walk. Peeling off a coat, scarf, mittens, and earmuffs, I headed into the bedroom where Hubby, sick with a head cold and stomach issues, is still in bed. As I continue to peel layers, sweatshirt, turtleneck, jeans, thermals, Hubby informs me that he has good new and bad news. It turns out that the plumber had called and they had found a replacement tank for us (that is the good news). However, they won't be able to get the tank until tomorrow morning (that, in case you can't tell, is the bad news!). Darn, darn, darn! As I stood there looking at Hubby all sweaty from my walk and knowing that I would sweat more during my weight routine, all I could think of was, "Great! Now I will really stink!" I just hope that the tank is up and running so I can shower tomorrow before going to class! Yesterday I made a trip to the grocery store. This is something that I normally do on Mondays but we had NO food in the house other than canned staples and frozen meet so, off I went! Yeah! Hubby was gone last week and so I didn't go to the store to buy stuff for only me. That means that I had a LOT of shopping to do! We were out of almost everything that we normally eat. I absolutely hate grocery shopping when you have to get "everything!" My cart filled up and then, at the check-out, the bill added up fast! At least Hubby carried everything in from the car! Lately I have been reading magazines. Lots of magazines. They seem to pile up as I am immersed in my current book and every once in a while I need to put off the book pile to take care of the magazines. Smithsonian is one of my favorite magazines. My friend, D, gives me her Smithsonians when she is done with them (hey - doing my part for the planet) and I devour them. They are full of such interesting stuff. The two I read yesterday both had articles about archeology in Turkey. Cool stuff. After the Smithsonians I will hit my National Geographics. I love the information in the magazines but they just seem to pile up quickly. What is piling up around your house? Voice Update: I did my massage and exercises yesterday despite the water heater "drama." My voice is doing well. I must keep on keepin' on with my exercises though! Something seems up with the water. I was washing my face before going to bed and . . . well, something just seemed wrong. It ALWAYS takes forever and a day to get hot water but tonight it seemed to take a bit longer. How frustrating! I really want instant hot water! Maybe I should talk to Hubby again about getting a small, tank-less, hot water heater for under my bathroom sink. Of course, the last time that we looked, they were a bit too expensive. Rats! Cold water just doesn't work for me! *Yawn* I feel good. I slept in as long as the kitties would allow and then leisurely read the comics while enjoying a nice breakfast. SCRATCH THAT! No - I woke up with the alarm buzzing like a swarm of angry bees and with both cats crawling around on my body. This, of course, hampered my ability to reach the alarm clock to silence the bees. Hubby woke up and mumbled something about people waking him up too early on a Saturday morning. Finally, the bees were silenced, the cats vacated the bed, and I was able to drag myself up to get dressed to walk. As I was pulling on my jeans I wandered to Hubby's side of the bed to check the temperature on the weather station receiver. I had to lean close to decipher the numbers in the near darkness of the bedroom. I squinted, rubbed my eyes, and then looked again. Yes. It really did say 32 degrees! Back to my armoire to find my thermals. I peeled off my jeans, tugged on the thermals, grabbed a thick turtleneck and my favorite over sized sweatshirt. I was almost to the kitchen before I remembered that socks might be a nice thing to wear on a cold morning like this. Turning around swiftly, I barely avoided a collision with the cats who were following me around the house. I grabbed some socks and then completed the voyage to the kitchen. Stopping for a minute to pull my socks onto already chilled feet, I then took care of kitty business. Food, water, litter box. Gulping water and morning pills, I scurried into the office to nab my iPod and then to the kitchen bar to find my keys. With everything I needed, including a new Kleenex in my pocket, I plopped on the floor, put on my shoes, got up and put on about twelve layers of coats, scarves, mittens, hats, and ear muffs. I was out the door running - well, not quite running but walking briskly. After the walk, which was abbreviated due to the possible freezer burn on my cheeks, I reversed the insulation process and stripped down to my thermals and turtleneck to do my weights. Huffing and puffing through the set (yes, I am back down to only one set these days), I finished and headed to the computer. After turning on the computer I headed to the bathroom for a pit stop as the computer booted. I turned on the hot water full blast to wash my hands and got a nice, strong stream of ice-cold water. Okay, so the hot water didn't make it to this bathroom in time to warm my hands. Thinking nothing of it I continued my morning routine of talking to my mom on IM while blogging. Because an allergy headache was dogging my steps, I returned to bed after my computer time and slept for a couple of warm, blissful hours. The water wasn't an issue until Hubby and I had finished dinner. Trying to be good I immediately turned on the hot water to fill the sink so I could wash the pots and pans. Cold water. Hmmmm. It seemed to be taking longer than normal. I let the water run for five minutes as I cleared the table and puttered around the kitchen. Still ice-cold. Finally, I had to inform Hubby that something was up. After hearing my report Hubby did his own investigation which involved running water in every bathroom and in the kitchen to see if he could get hot water. Zilch. We decided we had a problem. By this time, it was time for bed so I heated some water in the microwave to wash my face, gave myself a quick "sponge" bath, and crawled under the covers. I think the cats know something is up. They let me sleep until 7:00 A.M. Getting up, wrapping myself in my cozy robe, and avoiding the kitties twining 'neath my feet, I headed to the kitchen. First I took the morning meds and then went out front to collect the paper. Thinking that the hot water issue may have resolved itself during the night, I tried out the water situation. Lots and lots of cold and colder water. Absolutely no hot or even mildly warm water. Rats! Taking care of the kitty business, I headed back to bed. In the faint light I read an article in Reader's Digest as I settled down again into slumber. The next thing I know Hubby is walking into the room telling me that the hot water tank is fried. "Not good." I mumbled before falling back asleep. After much debate Hubby called a local plumber and had him come out (yes, on a Sunday!) to check out the tank. "There is water everywhere." Doug, the plumber said as he strode through the house to the front door. "That is never good." He left to call his boss from his truck and Hubby told me that there was/is apparently a leak in the tank and that the water from the leak had met up with the electrical parts of the tank and resulted in a big, old "melt-down." Thank goodness Hubby had enough sense to turn off the breaker controlling the electricity to the water heater and to unplug the heater from the outlet just to be safe. Doug came back in the house and immediately headed out to the garage to access the water heater again (which, by the way is in our attic!). He traveled in and out about three or four more times before telling us that his company could come out tomorrow to replace the tank. The tank, it seems, will be covered by warranty since it is way less than a year old. The labor - well, that is our responsibility. In the meantime there is no hot water and I am not looking forward to another microwave sponge bath! I don't smell, do I? Voice Update: My voice is doing well. I did two of the three sets of exercises yesterday. Such fun! Ten years ago, when Hubby and I moved to Texas, I accused him of moving us to Hell. Why? Well, we moved in September and the temperatures were still in the 100s! Compared to mild Ohio weather, that seemed like Hell to someone who doesn't like heat (me). Little did I know that there was more to come. Hubby has always had allergies. In Ohio they were annoying but not really too bad. Once we moved to Texas, however, they began to increase in intensity and duration, much to his disgust. Me - I had never experienced allergies in Ohio. After about a year in Texas I noticed that I got a "cold" every year around the same time. As time went on these "colds" got worse each year. Finally, I talked to a doctor and was informed that I didn't have a cold, I had allergies. Allergies???? I didn't know what to do with that information since I had never experienced allergies before. With Hubby's help I found some meds that made my yearly allergy experience bearable. Then we started to ponder just what I could be allergic to. On the news here they always give you a pollen and mold count. I didn't think that was odd at all because every channel did it. Hubby and I started paying attention and narrowed my irritants down to . 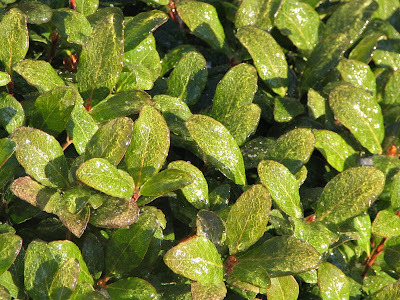 . . Mountain Cedar. Each time Mountain Cedar numbers started to rise I got a stuffed nose. Each and every time. It didn't take a rocket scientist to figure out what was the cause of my suffering. Well, this year has seen my allergies at the worst that they have ever been. My nose clogs, I sneeze (which, by the way, is messing with my throat and my voice), I have drainage (lovely to talk about, isn't it?) and coughing related to the drainage. What fun! In the past three days I have added a new symptom to my allergy arsenal - headaches. I wake up with a headache. I end the day with a headache. It is not a good thing. I know the headaches are allergy related and not migraine breeders (thank goodness) because of their location and the fact that when I take allergy meds again, they go away. Each time the meds start to wear off - headache! This year I found out some very interesting facts about the "hell" Hubby and I live in. Not only are the temps HOT in the summer but, apparently, the area is at a convergence of five (count them - FIVE) major "allergy zones." Allergens from five different "high concentration" areas blow.drift, waft, migrate to exactly the area where we live. GREAT! This explains why Hubby's allergies are a billion times worse here than in Ohio AND why I have allergies now when I never did before. 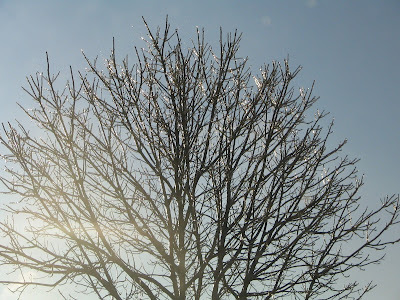 My problem is that a major concentration of Mountain Cedar, located in the Austin area, always sends pollen and allergens north during this time of the year. The problem goes as far north as northern Oklahoma. Super! I think I will just buy stock in allergy meds and Kleenex. Voice Update: Not too bad considering all the allergy junk going on. Each time I sneeze, it hurts my throat and my voice is a bit rough for a few minutes. Not good. I didn't do my massage yesterday - I don't really know why. I think I was just tired and distracted (I spent about 3 hours in the ASL lab). I am determined not to forget today! Yesterday was the second day of classes for me - and I survived! I must admit that taking three classes, all back-to-back makes for a LONG day! This situation was compounded by the fact that every single clock in the darn place was WRONG! I was in four different rooms and each clock had a different time! Supposedly the clocks are the atomic clocks which reset themselves automatically but - they must need new batteries! Frustrating. As I was leaving the building from my last class, Deaf Culture, I encountered a rather large group of people near the doors. Recognizing several of the people, I stopped and asked what was going on. It turns out that the group had just come out of ASL 2 with my "favorite" teacher (remember my experiences with her from last semester????) and they were upset. Mad. Disgruntled. The group was brainstorming ways to approach the dean of the college and the head of the ASL department to voice their displeasure. What were they so upset about? The teacher, of course! Apparently, she has said some things that directly contradict what they were taught in ASL 1 (which was taught by a Deaf person, by the way). Also, she allegedly told the class one thing and they went to ask the head of the department. When he said she was wrong and confronted her, she then claimed to have never told the class the wrong information. There was also a rumble of dissatisfaction with the way the teacher signs. When she signs, she sort of "talks" along with the signs. This is annoying several of her students and this was only the second class of the semester. When the group was done telling me what they were upset about, they then asked me what it was like for me in this teacher's class last semester. I told them the truth - that I basically ended up just gutting it out for the semester in order to get through the class. They didn't seem too excited about the prospect of sitting in the class all semester. What can I say other than "I told you so!" Voice Update: Still doing pretty good. I did my massage yesterday. Drainage from Mountain Cedar allergies are sort of mucking things up at the moment. Darn those trees! Yesterday I dove into my homework for my classes. Because I am pretty much a geek, I actually LIKE doing homework. It is interesting to me (unless it is just worthless "busy work") and I enjoy the challenge of learning something new. Even presentations are a challenge as I attempt (normally successfully) to work everything I know and/or have learned into the required time frame and format. My homework last night involved reading. One chapter in the Deaf Culture book and one chapter in "the green book." The Deaf Culture book was fine. In fact, it was pretty enjoyable since the book is research but is presented in a narrative style which makes the material easy to read and interesting. I whipped through that chapter and half of the next in no time at all. The "green book," however, is a different story. The "green book" is a book of grammar and history of ASL. Chapter one is entitled "What is Language?" Doesn't that sound exciting? Even that title didn't deter me in my mission to read the chapter. But then I hit the content . . . The entire chapter is 13 pages long and I have gotten through 5 of those pages. Each page is a dense collection of technical linguistic terms explaining the characteristics of language. English and various other languages including German, Latin, Russian, and Mandarin are compared and contrasted with ASL for each of the characteristics. Doesn't that sound like fun? I stopped when I hit the characteristic that a language must have relatively arbitrary symbols. My mind just couldn't take it anymore! I will read on later today. Or maybe tomorrow. . .
All of this linguistic reading led to a fun "word fest" with my mother last night. I called her to tell her about my "fun" reading and we ended up brainstorming words. The favorites turned out to be pejorative and mollycoddle. I thought they were neat! It was also a lot of fun just finding different words in the dictionary (the new electronic one Hubby got my for Christmas) and the thesaurus (also on the electronic dictionary). I do have to wonder though - do other people do this kind of stuff? Voice Update: Pretty good. Speech yesterday went well. Susan confirmed that my throat was a bit "crunchy" and managed to get in there and work a lot of it out in a pretty brief massage. She said that my voice was doing pretty well considering that I was sick last week and am dealing with allergy sinus drainage and sneezing, etc. I am to continue my routine of exercises and massage. Yesterday I started a new semester of classes at the community college. I am taking three classes, all related to American Sign Language, in an effort to further my progress in the program so that IF I go back to work next school year I can continue taking relevant classes. There are two "background" kind of classes which need to be taken and so I am taking those, Finger spelling and Deaf Culture, along with ASL 3. All three classes are basically back-to-back-to-back on Tuesdays and Thursdays, which is convenient for me. I can get all three out of the way at one time without having to worry about going on different days. A few focused hours and . .. done! While attending ASL 1 and ASL 2, I have met many of the other ASL students in the program but last night, I met a LOT more. Two of my classes are packed to the gills with 23 and 24 students. Most of these students are people I have never met. Since I am not really comfortable with meeting new people (even though people think I am really outgoing, I sort of quake inside at the thought of meeting new people), last night was an interesting time for me. Luckily, in two of my classes, there is at least one other student from my ASL 2 class - the teenager. It is nice to have a familiar face! Now that I have the first day out of the way I can settle in to the homework I have for Thursday. Fun, fun! I will be reading A LOT this semester and spending a LOT of time in the ASL lab! I am required to have 20 hours for each of two classes for a grand total of 40 hours! Of course, I have 30+ hours last semester for ASL 3 so it shouldn't be too much more effort. I hope. Do you cook in a crock pot? I never do but I tried to yesterday. Why, you may ask, don't I cook in a crock pot when it is SOOOO convenient? Well, Hubby is afraid that the house will burn down if I leave the thing on while we are both at work and since that was for the large part of our life together, I have gotten out of the habit of thinking of the crock pot. Yesterday, Hubby was out of town and I had a beef roast just begging to be made and I had classes all afternoon/evening. So, I got out the crock pot. First, I browned the roast on all sides, seasoned it, and added water and orange juice (I don't know why the OJ - I just like the flavor it gives the roast).. I put the whole shebang on the base and set the temp to medium low while I was home in the morning. After an hour or so, I added cut up potatoes and carrots. I checked the whole thing before leaving for class and it seemed to be doing fine. I turned the temp to low and left - for nine hours. When I got home, the house smelled wonderfully like roast beef. My mouth watered in anticipation. Then . . . I was disappointed. The beef was done but the potatoes and carrots were half cooked and half hard. Where did I go wrong? I decided to cut up the roast and potatoes and cook it some more today to make a beef stew. I will thicken the liquid and, hopefully, it will turn out yummy. Oh - I just want to say that this week - since it is my first back to school and with Hubby away - is a bit wacky so if I don't get a comment posted at your blog, forgive me and be patient! I am reading but don't have the time to type! Voice Update: I have speech today. I say that with a bit of a nervous feeling. Despite the fact that I HAVE been doing my massage and exercises pretty regularly lately (right?) my throat is a bit "crunchy." Normally, that is a sign that I haven't been massaging. I am worried that Susan is going to think that I have been slacking when I haven't! I don't know if the allergy bout I have been dealing with has caused some of the crunchiness or not. I have been sneezing a LOT lately and some of the sneezes seem to reach my throat. Also, I have drainage that causes me to cough -I try not to since coughing isn't good for your vocal cords (it isn't good for even healthy cords, by the way) but sometime I wake up coughing. I guess I will have to wait and see what Susan says. Well, Hubby is off on his business trip and I am looking forward to the roast which is bubbling away in my crock pot - something Hubby doesn't like to eat. The cats don't know that he is gone yet because they think he just went to work as normal. It will be interesting to see how they react tonight. This is the first time Skor will have experienced Hubby being gone with me still being home. In preparation for my week alone, Hubby and I went to Wal Mart yesterday. We really went because Hubby rented a car for the journey from the Budget rental place in Wal Mart and I had to take him to get the car. Since we were there anyway . . . we decided to pick up a few things. Isn't it always that was at Wal Mart? Well, while shopping, Hubby and I had the dubious pleasure of escorting a shopping cart up and down the aisles. This, by the way, was not one of those shopping carts that smoothly and quietly went about its business of collecting miscellaneous items. No, this cart was bound and determined to make its presence known to all shoppers near and far. It wasn't losing its rubber wheel like a shopping cart we had a while ago but, for some reason, one of its wheels loudly protested any movement in any direction. Hubby and I were accompanied by a loud "thump . . . thump . . . thump . . ." as we walked peppered with the occasionally skidding sound as the affected wheel simply refused to spin at all and let its co patriots push it along. *sigh* It is at times like this that my most frequent fantasy comes to life. No - it isn't one of THOSE fantasies! In this fantasy, I am a shopping cart rescue person - similar to a dog or cat rescue person. I troll the stores for shopping carts in distress and whisk them off to my truck waiting in the parking lot. Next, I hurry the ailing cart to my cozy workshop when I fix its broken down wheels and feed it a good diet of lubricating oil. I give the cart a thorough bath, making sure to scrape off the sticker residue on its handle and the gum from its basket. A warm blow dry with a brisk towel buff is the final step before I take the cart back to its natural environment and set it free. If I were on the job, there would be significantly fewer "injured" carts out there demanding attention and the world of stores would be nicer and safer for everyone. However, I realize just how fanciful this fantasy is when Hubby and I maneuver the thumping cart out of the store, across the horrendously bumpy tile in the entryway, and out to the parking lot. As we walk to our car we near another shopper pushing her cart up the row with her cart adding a nice "thump . . . thump . . . thump . . ." in syncopation to ours. I walked today after a week of "loafing." It felt good to be back in the swing of things. However, I did not get my weight routine done. My eyes are really bothering me this mornings so, after my walk, I flushed them with solution and rested for about 15 minutes prior to getting on the computer to IM with Mom. I hope my eyes calm down quickly - today is my first day back to classes at Collin County Community College and I have THREE classes all in a row to attend. I am nervous and excited all at the same time. I can't wait to go to the bookstore to buy my new books but I hope I can handle three classes. I am a little out of shape for such a heavy class schedule! Voice Update: I did my exercises yesterday and my voice seems pretty good. I will have to make sure I get my exercises and massage in between classes today while I am "at school!" How fun will that be? With Hubby out of town I won't have people to talk to at night so I think I will need to be making some phone calls in the evenings (well, on Wednesday because on Tuesday and Thursday I will be in class until 8:30). Happy MLK,Jr. Day. I hope everyone remembers what he tried to do with non-violence. If you haven't had a chance, drop by Sarah's blog to listen to his "I Have a Dream" speech. Hubby's home. Why does that throw me off? I guess I have my plans made for my week and then suddenly, he is here with other plans. If he tells me his plans at all! Of well, I do enjoy spending time with him and tomorrow he heads out of town for work for the rest of the week so I will miss him horribly. The temps here have been swinging as wildly as a dancer's tassels. In the day time the temps climb up to the high 60's but at night - brrr - it gets chilly. Need proof? Just check out this visitor to our bird feeder this morning. 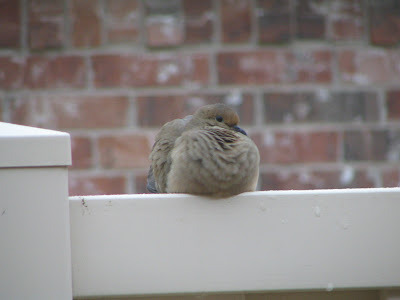 I don't think he got that fat from our birdseed! Last night my friend, D, and her daughter, C, joined Hubby and I for dinner at the Texas Roadhouse. This was a thank-you dinner from Hubby and me for their dedicated care of our kitties while we were gone during the holidays. We had a lot of fun at dinner. The food was good, there were lots of free yeast rolls and the company was great. After dinner we invited D and C back to our house for cheesecake (we have a freezer full thanks to my MIL who sent us a package from Omaha Steaks for Christmas) and Wii. First, we bowled. Hubby, C, and I bowled. D refused claiming some sort of video game deficiency (this was verified by C so . . . we let her off the hook). After bowling C and I raced cows. Yes, really. On the Wii Play game there is a game called Chase! It involved riding a cow through a twisting course while mowing down scarecrows posted in the middle of the course for points. It is too funny for words! Normally, I have to race my poor cow alone since Hubby refuses to be drawn into the silliness of this game. However, C joined right in and this led to a giggle fest which Hubby retreated from. Chase! was followed by fishing, target shooting, and billiards. D finally got into the action on billiards and wasn't too happy when I won (according to C I won totally by luck and I am pretty sure she is right!). It was a fun evening. We need to do it more often. Voice Update: Okay - I was cranky much of the day yesterday from a lack of sleep. I didn't do my massage or my exercises. My voice was pretty good but, I know that if I don't get right back on the ball, I will regret it! Here is a big YEAH for the kitties this morning! They let me sleep until almost 7:00! Amazing! Skor is still continuing his reign as the whiny kitty and throws in acts of destruction just to keep us on our toes. His latest destruction job? His FAVORITE toy. It is a fishing pole type toy with Mylar streamers. He always drags the thing around the house and the other day he brought it back to me . . . sort of. He only brought back the Mylar streamers - not the pole or the string - just the streamers. It took me about 15 minutes to hunt for the rest of the toy to see just what had happened. Here is what I have pieced together - Skor took his toy out for a tour of the house and decided it needed to check out behind the toilet. The only problem is that the toilet room is rather narrow and the stick couldn't make the tight turn. Not one to be deterred, Skor kept tugging until something gave. 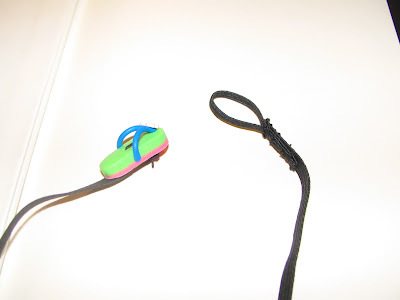 The streamers came out of the plastic piece by which they are connected to the string and the rest of the toy remained in the toilet room. Hubby, the king of the hot glue gun, glued the streamers back into the toy but not before I made a very interesting discovery. Skor LOVES this particular toy. He has several others but this is his favorite of all times. In fact, he would prefer to play with this toy even if it doesn't have any streamers attached. He likes it when it is just the stick and the string. And so does Miss Cleo. Hubby and I have been a bit saddened by Miss Cleo's lack of playing over the past several months. Last night, I found the key. The stick and the string. Now, she originally liked the Mylar streamers (fondly nicknamed Mr. Sparkly) but when Skor came in - she just laid there and watched him freak out chasing Mr. Sparkly. However, last night she was curled up to watch the nightly entertainment (Skor freaking out while chasing his toy) when suddenly, she pounced on the string, threw it up in the air and ran after it. I was in shock. Remember, Miss Cleo had basically stopped playing like this a LONG time ago. Hubby wasn't too impressed but then again, he was watching Ohio State basketball so I am not even sure he even noticed. Wanting to see just how far Miss Cleo would take the playing - since she had had very brief returns to playing in the past - I continue to play with both cats and the stick with the string on it. The two cats played very well together. Miss Cleo would watch as Skor ran like a crazy kitty after the string and, when he had caught it and was resting, she would take her turn chasing the string in a much more sedate, but still active, manner. Skor would watch until she had caught the string and had thrown it around a bit. Then he was ready to play again. I kept this up for over a half an hour and only stopped because of MY arms getting tired - not because either cat wanted to quit. This morning, after feeding the cats, I got out the toy (remember, it is just a stick with string on it) and BOTH cats played again. Eureka! I think I have found the secret. Who needs the streamers? Just trail the string around and both cats act like it is the best toy ever. This will save us a lot of money in cat toys! Voice Update: Doing pretty well. I am still doing my massage. I have gotten into a routine of doing it each time I am in the car as well as during commercials when I am watching tv. The sessions are not very long but I do a lot of them so the time adds up. I think my voice is doing pretty well. I still have some issues with those unvoiced consonants but they are currently barely noticeable. Yeah! This week has been a real bummer for me since I have been sick most of the time. Needless to say, I didn't get out too much. Yes, Hubby and I went to JoAnn's to get some pictures framed but that was pretty much it. I was getting a bit stir crazy! Yesterday, I braved the chilly temps (again - chilly for TEXAS) and went to Wal Mart. I felt like a kid in a candy store! Suddenly, all of the mundane things in Wal Mart seemed sparkly and new. Everything was interesting and deserved attention (everything except the auto parts section - that still seemed sort of dark and grimy to me). I wandered up and down the aisles despite the list in my pocket. I looked at cookware and laundry baskets, vacuum cleaners and clothes hangers, sheet sets and pillows. The electronics section was next and all of the CDs and video games were enthralling. On to the craft section (which, by the way, I hear will be eliminated some day - horrible!) and then a quick left to head to the clothing section to browse the sock aisle. After the socks groceries were the next adventure. I checked out the chip aisle, the dairy aisles and then strolled down the meat aisle fascinated by the choices which don't show up in Kroger. Bison. Lamb. Tripe (okay - just who is buying all the tripe? There were LOTS of packages of the stuff in the bins!). After the groceries I perused the end caps as I headed to the check-outs. The book section was on the way with a special "sale" table out front that caught my attention. Books of all sorts and CDs were strewn across the table like tempting desserts. I checked each out in turn. Feeling happy after my illness, I chatted with the check-out woman about her son who just joined the Marines. Even the woman behind me got in on the conversation. It was a nice trip to the mega-store! Oh - did I mention slippers were half off? Voice Update: So-so. I have been a good girl and have been doing my massage (when I have been awake) but yesterday my voice had a tough time. True, it was at its worst when Hubby asked me to repeat something for the THIRD time. Most of the time it was just fine. *sigh* I guess it is just in need of more work! Well, I am feeling slightly better (again) this morning. Let's all hope that it stays that way! It is COLD here in Texas - only 26 degrees! **Editor's Note: Yes, I KNOW 26 degrees isn't cold in some parts of the country and that those same parts are having even colder temperatures but, come on, this is TEXAS! I was thinking of walking again this morning for the first time since I got sick but, I thought better of it and stayed in bed for an extra hour instead! 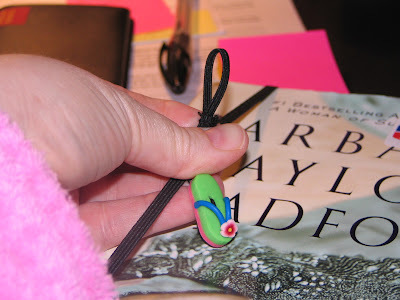 Today I have a couple of book reviews for you and then an explanation of just how my elastic bookmarks work. Here is the first book. 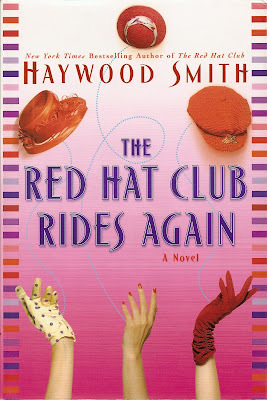 The Red hat Club Rides Again by Haywood Smith. My Aunt Donna gave me this book and even though I had not read the first book, I enjoyed this one. The Red Hat Club, composed of six women who have been friends for a LONG time (I can't remember exactly how long), meets once a month to have lunch and a lucious talk. This time the club members "ride" to the rescue of one of their own, Pru, who is lost in the throes of drugs and bad company. The club travels to Las Vegas, courtesy of the rich member of the group who has a private jet, and kidnaps Pru and sets her up in an exclusive rehab. The group then undertakes a special "make-over" cruise once Pru is out of rehab. During the trip to Vegas, the cruise, and everything in between, the group follows the ten rules they have created for their group and their lives work through various complications which add interest and reality to the characters. Like I said, I haven't read the original (I did pick it up at Half-Price books recently with my coupon!) but I will say that this book was a fun read. I had no problem identifying with the characters and becoming involved in their exploits. A fun book. 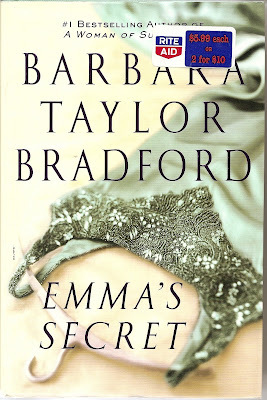 Next up is Emma's Secret by Barbara Taylor Bradford. Again, this book was given to me by Aunt Donna and it isn't the first in the series. However, this book stands alone well enough that you don't need to have read the other books written about the same characters. Three clans, the Hartes, the O'Neills, and the Kallinskis, are intertwined due to their long history together which began with great-grandparents. The three families are powerful in business but the grandchildren are hardworking and dedicated despite the family money. In this book, a young woman from America, Evan, comes to London to seek Emma Harte, the matriarch of the Harte clan, whom her grandmother has told her to seek out. She is dissappointed to learn that Emma has been dead for thirty odd years but decides to remain in London and takes a job at the Harte business, a prostegious department store chain. Evan's appearance causes quite a disturbanc among the clans. Her appearance, at first glance, reminds people of Paula, the current matriarch of the Harte clan. The resemblence starts a search of the family tree to determine if Evan is a part of the family or not (and as such, a possible threat to the inheritence of the grandchildren). During the course of the investigation, the family "black sheep" returns to London and attempts to stir up trouble as he seeks revenge against Paula for past slights. This puts a slight kink in things and before it is all over, a family secret is revealed for the first time in thirty odd years. I really liked this book. However, I do think that the ending was a bit abrupt. Perhaps this is because there is another book concerning the same characters? In any event, the book was interesting and a good read. I might even go back and find the other books written about the same characters. They should be interesting as well! Okay - time for the bookmark "how-to" session. To utilize the book mark, you follow these steps. 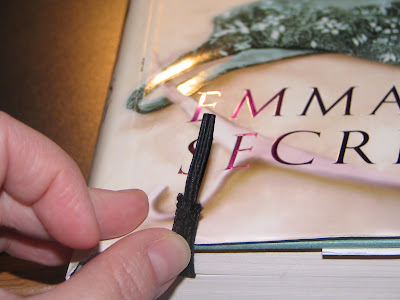 First, insert the elastic into the book where you want your place marked. Next, close the book and bring the two ends to the front of the book (I suppose you could bring them to the back just as easily). Finally, loop the buttonhole/loop around the decorative button. That is all there is to it! Simple! These are fun to make and look cute as well. In my first efforts, I cut a buttonhole into the flat elastic but I didn't like the way that worked so for this one, I sewed a loop of thinner flat elastic onto the end. I think it will work well. Voice Update: My voice is having some issues - probably due to the fact that I haven't been talking much lately. I DID do my massage and exercises yesterday though. What goes up must come down . . . and go up, and come down, and go up . . .
What fun! A little frustrating. The only thing that is good is that there is no vomiting or other bodily function coming along for the ride. I just feel achy and tired a lot. I am beginning to suspect that this is a ploy to get me to buy more aspirin . . . what do you think? And yes, if this keeps up for another full day I will make and appointment to see Doc Feelie, which isn't my favorite thing to do. In other news, Hubby and I went to JoAnn's yesterday to get a couple pictures framed. One was a scene from Victoria, British Columbia and one was a castle in Austria. I hope to hang them in my music room but . . . who knows where they will end up. Framing is such fun. The first thing the framing guy asked was . . . "Do you know how you want these framed?" Ummmm..... no. "Where are you planning on hanging them?" Ummmmm . . . . we aren't sure. We were off to such a good start! After trying about a billion different frames and a million mats for the castle, Hubby and I finally decided on a blue mat and two different yet coordinated cherry frames. Whew - thank goodness that is over. There are just so many choices! I felt bad for the framing guy for having to go through all of that with us. Then, to add insult to injury, he had to check us out when I went up front to buy my elastic. What is that? Why was I buying elastic? 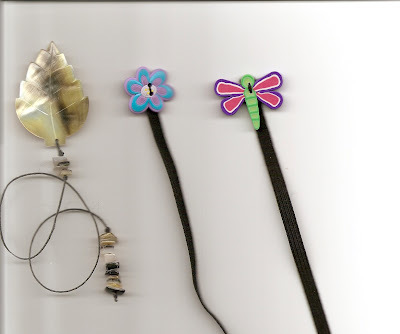 Well, I promised my Aunt Donna that I would make her some bookmarks and I want to make her one of the nifty ones using the elastic. Do you remember those? No? Here is a picture to refresh your memory. 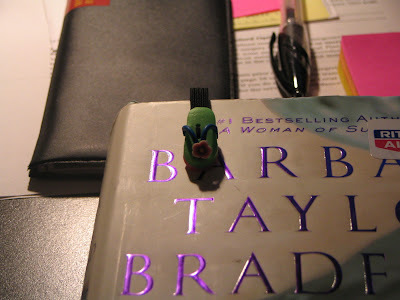 I thought I had a picture of the bookmark in action but apparently I deleted it. Well, the bookmarks on the right are made of elastic and they work by stretching the elastic around the book. 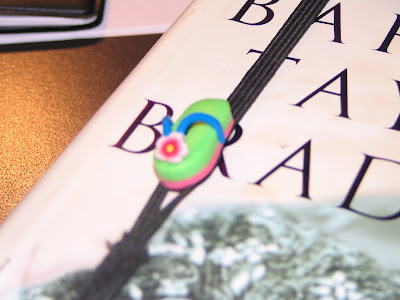 You put the elastic in the book to mark your page and then stretch both ends to the front and "button" the elastic around the colorful button to secure it in place. 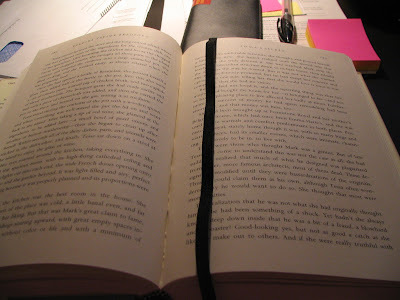 They work really well and also help keep the book open to the right page. Anyway - I want to improve on the design a bit so I wanted to buy some black round, cord elastic. The fates are against me though. They never have the stuff when I am there. The little hook has the label "black cord elastic" hanging tantalizingly from it but, alas, the area is empty! So I chose a really thin braided, flat elastic. We will see how that goes. My idea is to sew this elastic in a loop onto the wider elastic which goes inside the book and around to the front. The little look will go around the button and will keep me from having to cut a "buttonhole" into the wider elastic. I will let you know how it works out! I am off to find something for breakfast that is slightly appealing. Nothing sounds too good to me at the moment. Then I might just take some more aspirin and go back to bed. Again. What a life! Voice Update: My voice is doing well. I did my massage FIVE times yesterday. There wasn't much else to do so I just massaged away! My throat is a bit more "crunchy" than I would like it to be (translation, my throat isn't as loose as I would like it to be and makes "lovely" crunching sounds to let me know.) but I am working on that. Yesterday was a big old bummer of a day. I slept pretty much all day and when I was awake I felt like going back to sleep. How exciting! Luckily, a good dose of Tylenol and some more sleep last night knocked the rest of my fever out and this morning I am almost back to normal. My normal temp is a bit lower than average - it is 97.6 or so most days. This is why I have a hard time explaining to the doctor that 99.5 IS a temp for me worth being worried about. Anyway - it is normal again so . . . . I have a question for all you bloggers out there. Do you look to see where all of your readers come from? 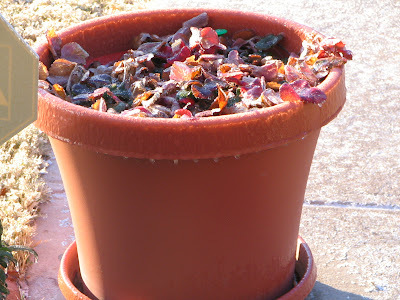 The little Feed-it box on my blog has intrigued me from the moment I put it on my site. Every day when I finish blogging and reading the blogs I am addicted to, I check the little box to see where people have come from lately. I even keep track of the cities, states, and countries. Hubby says it gives me something to do. I personally think it is neat that so many different people from so many different places actually visit my humble little blog. True, many of them get to my blog by mistake. They search things on google which are totally unrelated to what I am blathering about and - voila! They end up on my blog! I sometimes wonder if they count as actual "readers" because I am sure they high tail it right off my blog as soon as they realize that my "naughty knees" are not exactly what they were looking for.However, they came so I count them! Am I the only one with this obsession? No walking or weights either yesterday or today. I plan on getting going tomorrow again with the routine. Voice Update: As I was asleep most of yesterday it is hard to really get a good "fix" on my voice level. I did do my massage twice yesterday and one time included the "thumper" massager. We will see what today brings! My temperature is 101.3. Not good. You might be able to tell from that number that I am not feeling too well this morning. Why is it that I can be so hot that my head feels like it is on fire (I have taken aspirin by the way) and my fingers can still feel like ice? I am calling Skor up onto my lap just so I can warm up my fingers in his fur! The funny thing is that I felt fine yesterday and last night. It wasn't until I woke up at about 2:30 in the morning that I knew something was wrong. Hopefully it will be gone as quickly as it come on. I'll talk to you all tomorrow then. Voice Update: Who knows. I haven't really talked at all today and don't know if I will. To Follow or Not to Follow, Why is That the question? As I walked this morning I was listening to my podcasts, as usual. I know, I know, I am totally addicted to podcasts but, with such wonderful content, how can you not become addicted? Anyway, I was listening to Shot Cummings Audio - a podcast in which a guy - Kevin Cummings - relates stories from his experiences in short, six minute episodes. He has a wonderfully droll sense of humor and makes me laugh out loud - which is difficult to do. You can find his podcasts by going to his website. Because I listen to a LOT of podcasts, I tend to have a backlog of them at any given time. This morning I listened to three different episodes of Short Cummings Audio and one really hit a nerve. He was talking about people who don't follow rules. Hubby and I were just talking about that the other day! People not following the rules is something that really bugs me. It never fails to amaze me that in our society, people who don't follow the rules are rewarded (often not intentionally) while those of us who doggedly follow the rules are left in the dust (or are inconvenienced). One example is on airplanes. There is a clear rule that you are supposed to only have two carry-ons, one of which is a purse or other personal item. Have you seen the size of some of these "purses?" I think I could fit in some of them! What about the men who have the rolling carry-on and then the HUGE duffel bag? Is the bag really personal? The whole concept of "personal item" was intended to be for women and their purses and, in the interest of fairness, HAD to be extended to men but, come on! Another example relating to airplanes is walking in the airport concourse. Weren't most people taught to walk to the right side of the hallway so others can walk on the other side? I don't know how that works in countries where they drive on the left side of the road but . . .
Why is it that I will be walking along on the right side of the hallway and someone coming the opposite direction will basically walk right into me even though there is LOTS of room toward the middle of the hallway? Hubby thinks it is because I become invisible in public places and, this might be true since I also have problems activating those motion-activated faucets and towel dispensers. Related to airport hallway behavior is the person who pulls out of a side street and cuts me off despite the fact that there are NO CARS behind me! What is that all about? My rant is almost over but I do have to wonder just what is it that parents are teaching their children these days? That as long as you get what YOU want, who cares about everyone else? Exercise update: I walked this morning and then did my weight routine TWICE! That is how you are supposed to do the routine but I couldn't handle that when I started! Today, I went for it and I think I will be feeling it for a while! Voice Update: One massage session yesterday -not the best but . . . not the worst. My voice is okay but more massage will make it better. Just a short post for today since I am getting to it so late. You may notice that I posted a new podcast episode - number 27. This is basically a podcast of the blog post "Yeah!" So - if you have read that post - you have "heard" the podcast. If you missed that one, check out the podcast to hear it "straight from the horse's mouth" so to speak. I didn't do my massages yesterday - I was cranky and had the DI meeting and . . . I guess I could come up with a million excuses but none of them are good enough to explain why I didn't do the exercises which are so vital to me keeping my voice in good shape. In fact, I noticed when doing my podcast today that my voice isn't as good as it was earlier in the week when I was doing my exercises regularly. Darn! That should give me a good kick in the pants! My next spate of classes doesn't start for another week and I am getting a little stir crazy. Hubby kindly suggested that I find something to do which will keep my mind busy so I dug out my Logic and Math Puzzle book to take a crack at some of those. Maybe that will keep me going for this next week. I can't remember if I have said that I was thinking of going back to teaching next year on this blog or not. Well, I have been thinking about it. And I am split pretty much right down the center as to how I feel about the whole shebang! Part of me - the part which loves teaching and kids and that structure - really wants to get back into the swing of the classroom. I want to feel like I am making a difference in the lives of some kiddos. The other part - the part which remembers all of the paperwork and silly requirements made by the Texas Legislature - wants to run screaming the other direction! What to do, what to do? I keep thinking about it. It is nice to know that I can think about the situation without having a panic attack - something I couldn't do right after I had to quit teaching (in additional to my voice issues there was a nasty, nasty principal who really caused me some serious anxiety). That is progress, right? I still have a little time - not too much if I want my application in there at the beginning of things. I wish that God would just send me a neon sign with instructions on it. Do you think that is too much to ask? I hope you had a super weekend! Voice Update: Well, I pretty much said it all in the post but here we go - I didn't do my massage or exercises yesterday and not too much today (once) so my voice is a bit shaky. I am missing more p's and h's than I have been lately. I am getting "back on the horse" though and working like the dickens this week so that I can get back in shape. Books, Books, I Gotta Have My Books! Back Home and Busy, Busy, Busy!